To date I've completed five of my 11 garments. I really like a few of the pieces, especially the white blouse. I've never finished a SWAP before, but I've started more than a few in my lifetime. The colors I picked out were navy, burgundy and white. These are colors that look good on me and I had almost all of them in my stash. 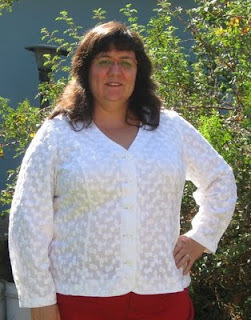 The first garment I made was this silk knit tie-neck Coldwater Creek knock-off top. I drafted the pattern from my TNT KS 2900. I've made this pattern four times now, but I don't think I'm ready to retire it quite yet. 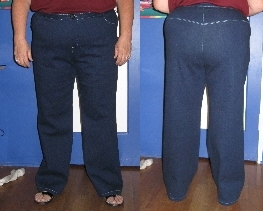 I tried out a new pattern for the moleskin pants. It has a wider leg than I'm used to and I probably made them too long at least for these shoes. I may go back and alter them, but I may not. They won't be my first pick in the wardrobe, but they do work with everything else and several other things already in the closet. The white blouse is my favorite of all the pieces so far. It's made from the TNT pattern I talked about in my last blog post. The fabric is a beautiful embroidered cotton. The embroidery puckered up the fabric and completely eliminated the need for ironing. I used white Kona cotton for the facing and didn't use any interfacing since the Kona cotton is so much heavier than the fashion fabric. 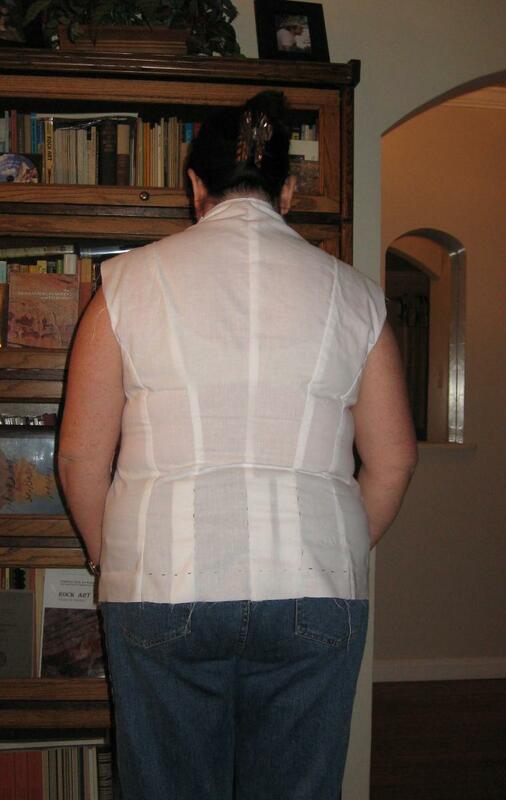 I must have 200 buttons in my stash, but none of them would work for this blouse. Since I'm trying to not spend any money right now, I decided to buy the 90 cent a card buttons from Joann's. I think the plain buttons look good with this highly decorated fabric. Sorry I haven't washed out the buttonhole marks yet. I don't have a long sleeve pattern for this blouse so I took the puffed sleeve pattern, folded out 3" from the center and cut it out adding length and narrowing toward the hem as I cut. I did have to true the cap after I cut it out. After sewing the sleeves in and hemming them, I discovered I didn't narrow the hem enough. To fix this, I just added two buttons folding out two inches which made a cute little pleat. The buttons are sewn on top of the fabric, no buttonholes were necessary. I really like the way these turned out. I must draft a real pattern for the long sleeve for next time I use this pattern. The last two garments I've finished are the twin sweater set. For the top I used KS 2900, which is the same pattern used for the blue tie-neck top. Because the poly/rayon/lycra Sophia knit doesn't have any stretch in length and very little in the width, I added a dart and 1/2" to the side seams. I should have added more than the 1/2" to the sleeves as they are just a tiny bit too narrow. 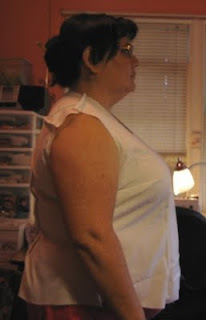 In this picture I have a decorative stitch on the neckline where I just folded the edge over. But, as you can see, the neckline was gaping some and even more with the cardigan. So today I spend about 3 hours unpicking the stiches and put on a binding. The binding mostly eliminated the gaping. I was afraid to pull it too tight which would have caused puckers. So, I'm going to live with the slight gape. The cardigan is another pattern that I've sewn before. It's New Look 6735 which was a Best Pattern for 2008 on Patternreview.com. I shortened it two inches, but I'm only 5'1" tall. I didn't want to look like a little girl wearing her mom's clothes. I had to also buy new buttons for the cardigan. I'm beginning to think it's a waste for me to have a button stash. I never can find the right button in my collection. There you have it. My Fall 2009 Sewing with a Plan so far. I have the denim jeans and the corduroy pants already cut out. Since my sub job for tomorrow was canceled, I'll probably work on them. I can't decide if I want to sew them separately, or in assembly line fashion. I'm using the same pattern for both and they are the same color, just different fabrications. I'm hoping the corduroy is more dressy than the denim but just as comfortable. This is a casual wardrobe, so both will fit right in. I've been thinking a lot about TNT patterns, or Tried and True patterns. I have a tendency to reuse patterns a great deal. 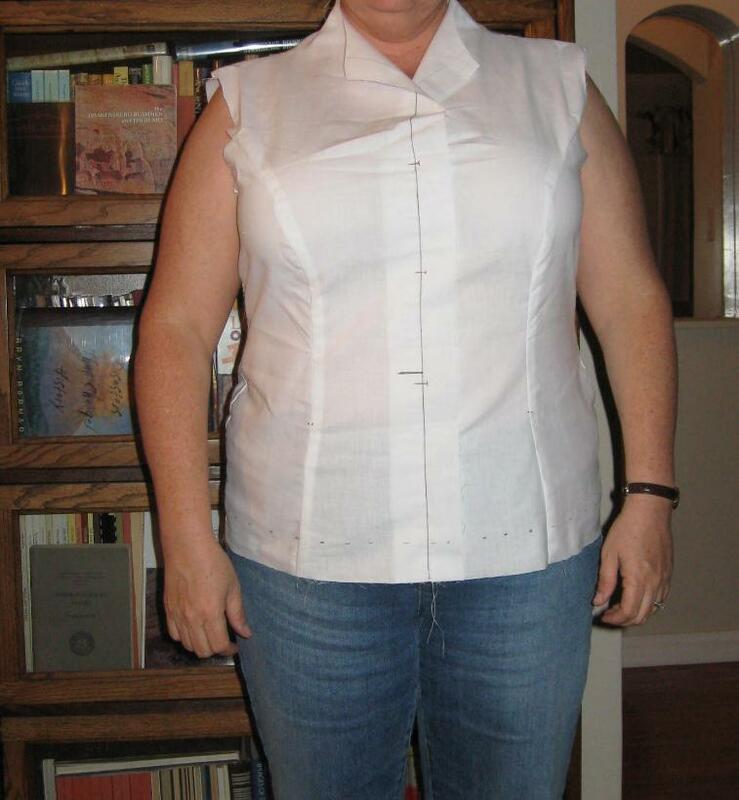 I know other sewists do this too, like Carolyn. I don't think I'd enjoy sewing as much as I do if I didn't have TNT patterns. They are like old friends. You may not call on them regularly, but when you need them, you know they'll be there for you. However, lately I've been depending on them a whole lot. I don't see anything wrong with it either. How many of us wear the same clothes over and over again because it just fits right? Like it was made specifically for you and sewn in the most wonderful fabrics. That's what a TNT pattern can do for you every time you visit the sewing machine, if you want. New patterns are like meeting new people. You may hit it off right away, but then again, you may not like each other at all. Your personalities can work together if you don't spend much time together, but they won't be there for you when you really need a friend. New patterns have to be altered, for me more than once. It takes a lot of work to get a pattern to the TNT phase and many patterns, actually most patterns, just don't make it to this stage. 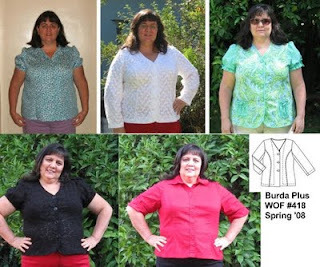 Lately, I've been getting a lot of mileage from Burda Plus WOF Spring 08 #418. This pattern was one that took some hard work on my part to get it to the TNT stage. 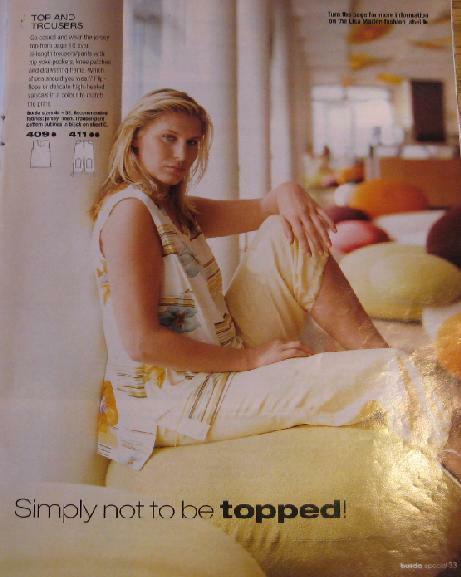 The one thing it had going for it was that it was a plus half size pattern. 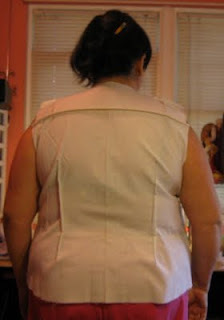 Patterns made for short AND fat people are far and few between. 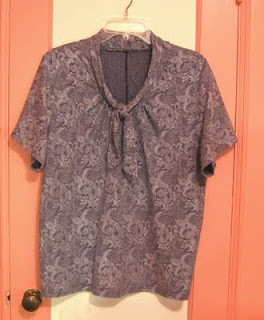 The original pattern looked nothing like the blouse I've been using it for. Of course I made a muslin for it. As you can see, it had some problems. First of all, who thought it was a good idea to put this very high neck on a short fat women? Most of us don't have the long elegant neck of the tall model in their fashion photo. Some of us don't even have a neck. I cut the neckline down so that I could add a collar if I wanted to. 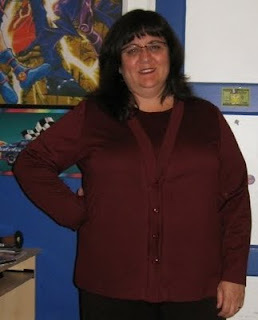 As you can see in the composite picture, I made one blouse with a rounded convertible collar and one blouse with a collar and collar stand with the classic button band. Other changes I've made to this pattern was to round the bottom center front for a nice look since I don't tuck in my blouses. I've also changed up the sleeves. Only the top right and lower left blouses have the same sleeve. 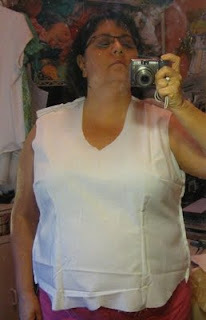 For the red blouse and the white blouse I used the same puffed sleeve and folded out the puff and added length. There are still so many ways I can change up this pattern. The only down side to this pattern is that it has so many seams. The back has a center back seam and two princess seams for a total of 6 seams. The front and back princess seams work great for fitting purposes, but these seams also break up the print on any large motif fabric I may want to use. 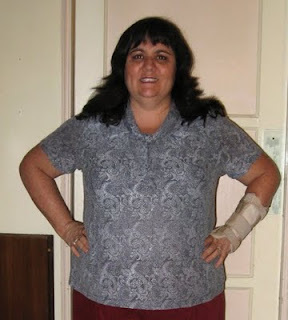 For that reason, I'm still searching for the perfect darted blouse pattern. I highly recommend that you consider working on getting some TNT patterns. It doesn't have to look like you're sewing with the same pattern over and over again. People will think you're brilliant at fitting, which of course, you are. Making design changes aren't as hard as they look. 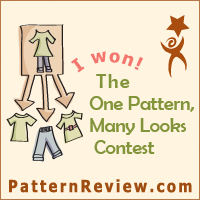 You might want to pick up a few books on pattern drafting or take a class or two. It's really a lot of fun and look how your wardrobe can grow! I did it, finished garment number 1. Only 10 more to go. This has to be the prettiest top I've made in a very long time. I drafted it from my TNT t-shirt pattern, KS 2900. I've reviewed the re-drafted pattern before. It's made with a silk stretch lace knit that I purchased probably 10 years ago. I think I found it at a sewing expo booth being sold by either Peggy Sagers or Cynthia Guffery. It's a frosted light blue with a navy blue under the design. Hard to describe but beautiful in person. I think the reason I hadn't used this fabric before now is because I didn't have enough to cut it out correctly. I think it was only 36" wide. It should have been cut in one direction since light plays on the frosted part and the design is one way. However, since I didn't have enough fabric, I had to cut with the front and back going two different directions. I think only someone who studied the print in the right light with my arms up would notice. The silk feels very different than cotton or rayon knit. I've already got the next garment mostly done. It's the burgundy stretch moleskin slacks. 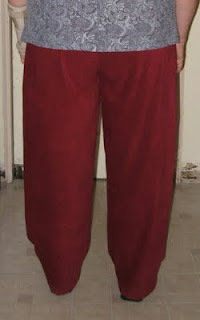 I just need to find someone to help me get the hem length right and finish with the waistband. The third garment is all cut out and waiting for me. It will be the white long sleeved top. However, tomorrow I'll be visiting the Huntington Library with my family and MIL so I may not get any sewing done.